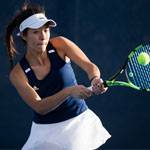 The 31st-ranked UC San Diego women’s tennis program has a busy four-match Spring Break week. The Tritons host fifth-ranked Division III power Williams College on Monday at noon. Admission is free at Northview Tennis Courts. Parking permit required.